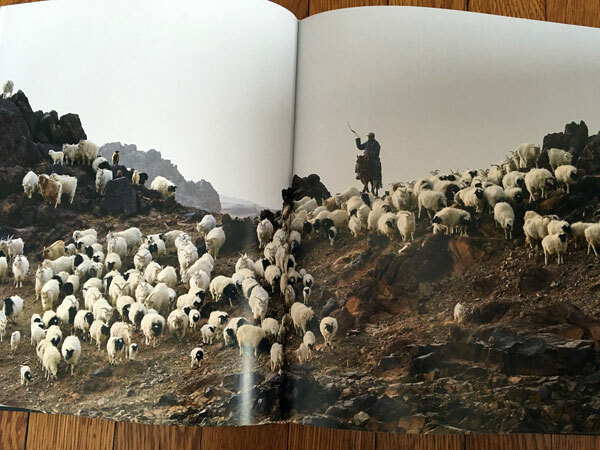 a few weeks ago, i received a copy of this beautiful book—in search of the world’s finest wools, written and photographed by dominic dormeuil, current chairman of house of dormeuil and jean-baptiste rabouan, whose photojournalistic work has focused on the cultures of nomadic people. 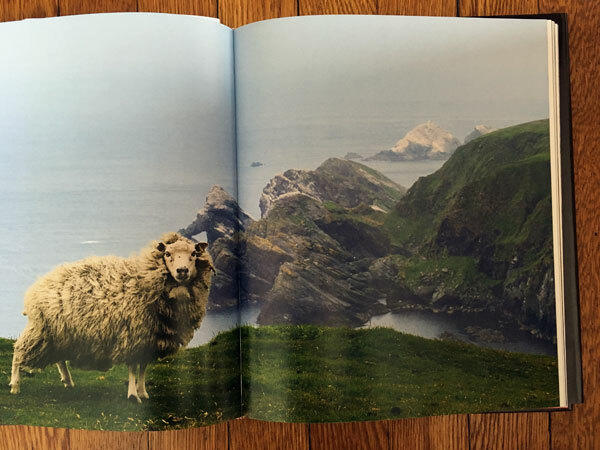 sensing the profound impact of social, economic, and environmental change on the global wool industry and wishing to acknowledge the “growers and artisans of wool”, the authors set out to meet and photograph the animals, people, and places around the globe that produce our most precious fibers. 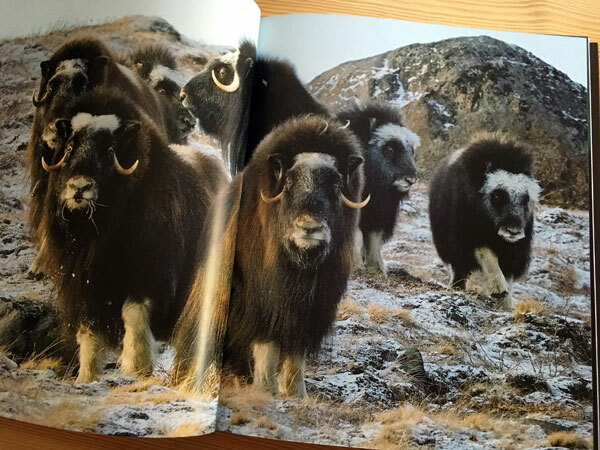 for the reader, the journey begins on the tundra in greenland to study the ancient musk ox, producer of rare, fine qiviut wool. 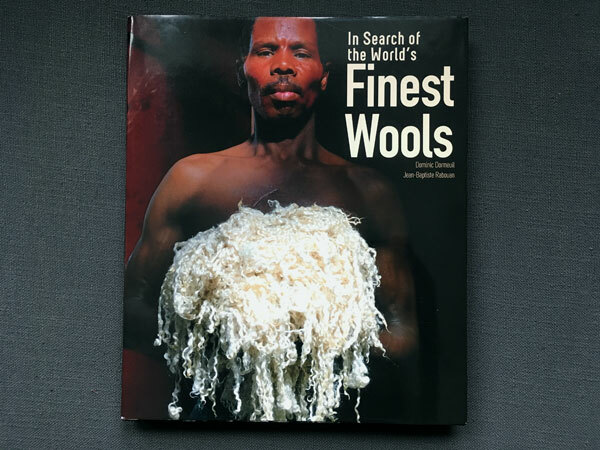 what i love about this book is the knowledge that is shared throughout its pages—it’s not only a stunning photographic encyclopedia, but also the well researched product of a passionate wool advocate. 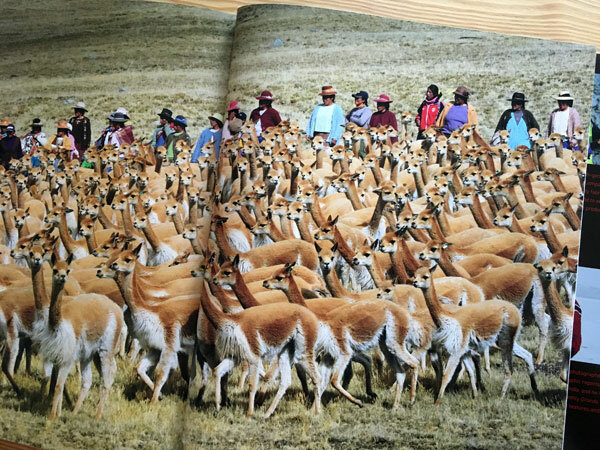 dormeuil, whose family textile firm has operated for five generations within the global fiber market, writes with great sensitivity, depth, and concern for the relationship between man, animal, and environment. 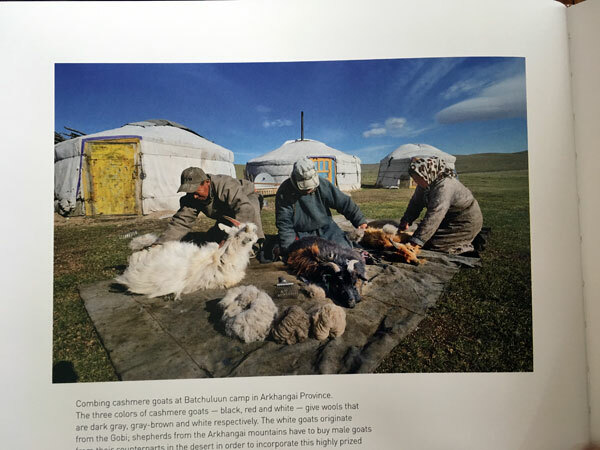 from greenland, we travel across the book’s pages to mongolia, where the best cashmere fiber is grown and harvested. one fact that is driven home time and again throughout this story is that much of the world’s most precious fibers are produced in the harshest climates. and while maybe not places where the majority of the world wishes—or has the temerity—to live, these environments hang in a delicate balance on which we all have an impact. directly related to that fact is the realization that we would know nothing of these fiber rarities if it weren’t for the fierce preservation of ancestral traditions by highly skilled farmers and herdsman. 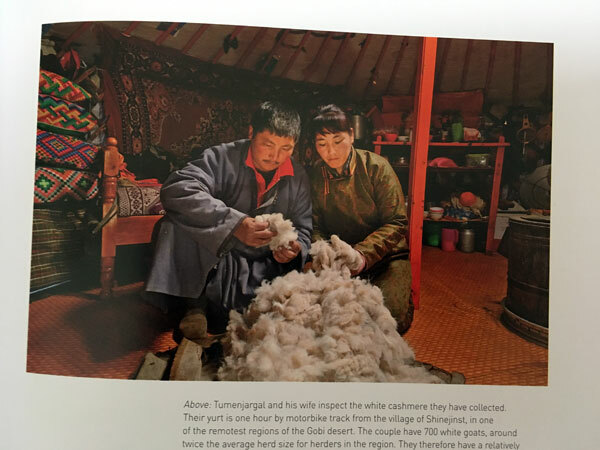 from the ability to understand climate, terrain, and husbandry, to the assessment and marketing of product, deep cultural traditions play an enormous role in whether or not we will knit or weave or sew with cashmere, qiviut, mohair, yak, vicuña, or taewit wools. 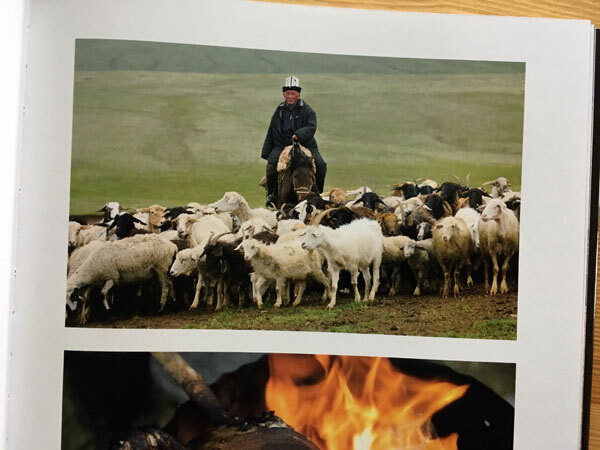 on kyrgyztan’s vast grazing lands, the authors teach us about that last one—taewit—gleaned from a unique cashmere-cross goat originating in the region during the period when the soviets used kyrgyzstan as an agricultural breeding laboratory and showcase for communism. 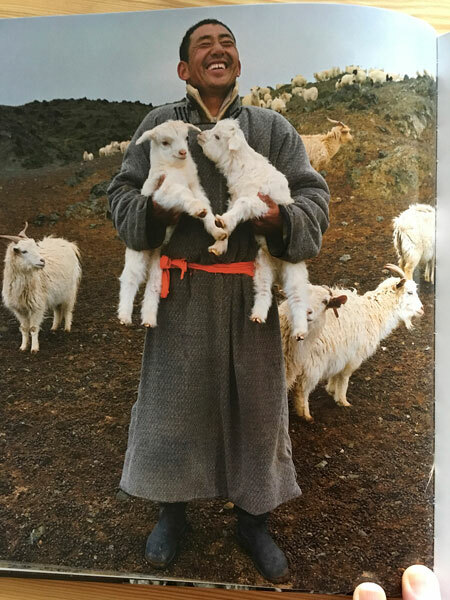 from there we move on to ladakh and the high western plateau of tibet, known as changtang, where pashmina goats are raised. as with so many other rare fibers, these goats can only be raised by herdsmen willing to practice their husbandry in a wild, inhospitable place. not only is the climate in this area harsh and resources limited due to the extreme altitude, but predators are many. 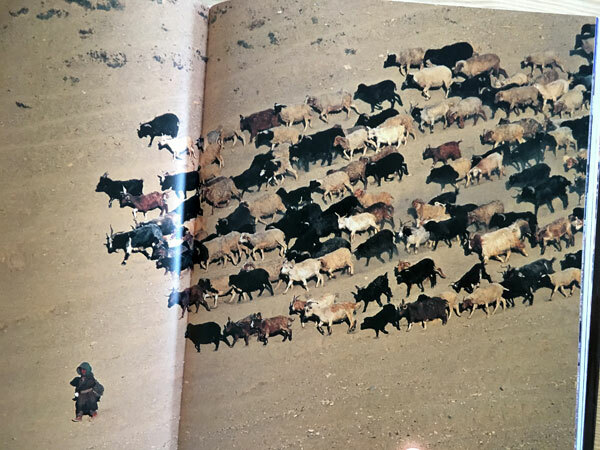 the lifestyle of the herdsmen is seen as almost anachronistic when compared to that of villages in nearby settlements, but for the time being the pursuit of the fine pashmina fiber helps it persist. 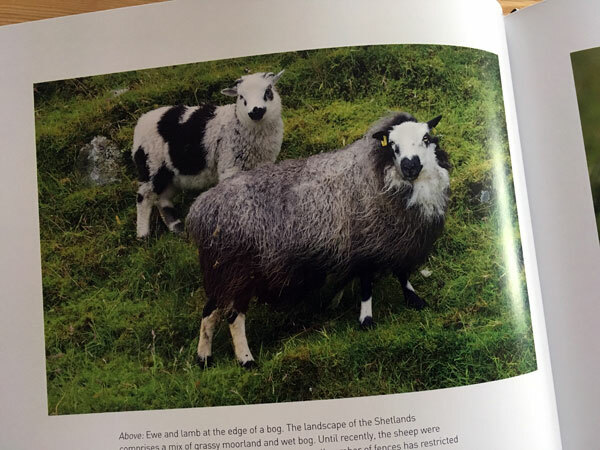 from ladakh, we are taken to the shetland islands, where sheep are the focus for the first time in the book. thanks to its rather isolated location, shetland is home to breeds preserved and maintained from ancient stock of scandinavian sheep, brought to the islands from nearby norway by the vikings. the scandinavians established a sustainable rural society on shetland, which included the processing of wool and manufacture of wool yarn, textiles, and garments—first by hand at home for family use and eventually, for trade. 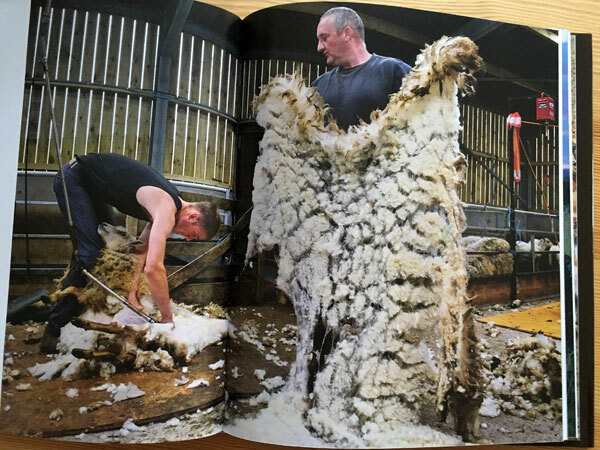 today, shetland’s wool industry continues to thrive and grow, with investment in eco-friendly milling and processing. 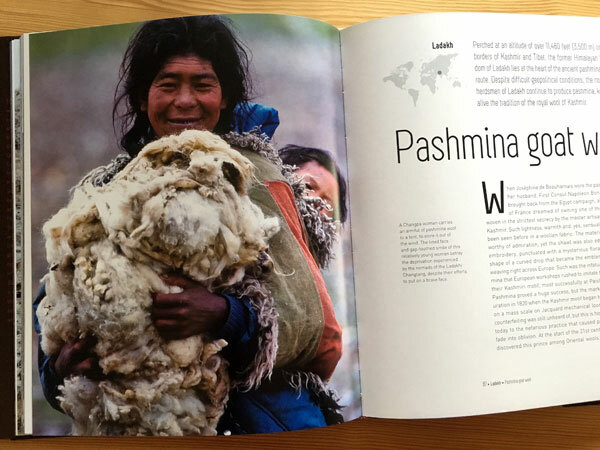 while reintroducing us to a perhaps more familiar culture, the author still provides some thoughtful reminders that wool is a product of place, history, and environment toward which humans have a responsibility. next we leap from nearly the top of the globe to the bottom, landing in new zealand and australia where the world’s largest percentage of merino wool is raised. thanks to the a scottish immigrant named eliza forlonge who gathered the first flock of saxon merino sheep and sent them to australia, almost every knitter is familiar with the squishy, springy, soft merino fiber. 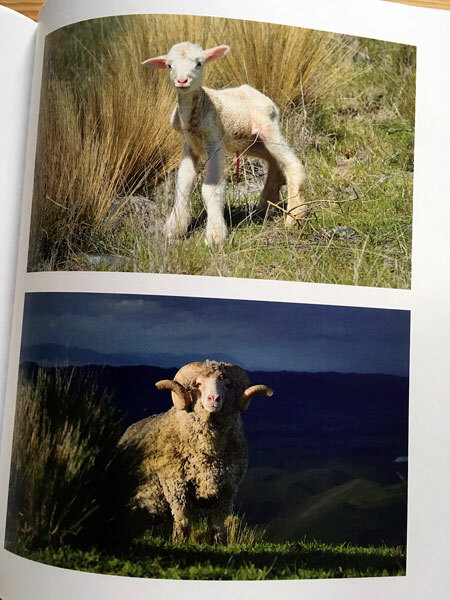 a few of those first imported sheep were purchased by the ranch we visit in this chapter as we get a glimpse of what it takes to run a herd of 12,000 merinos while adhering to the strict oversight of the australian trade organizations. 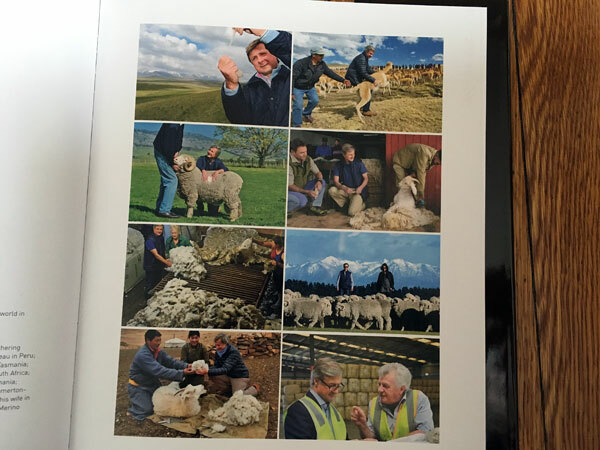 again, so fascinating to absorb and understand exactly what it takes to provide wool for our pleasure. 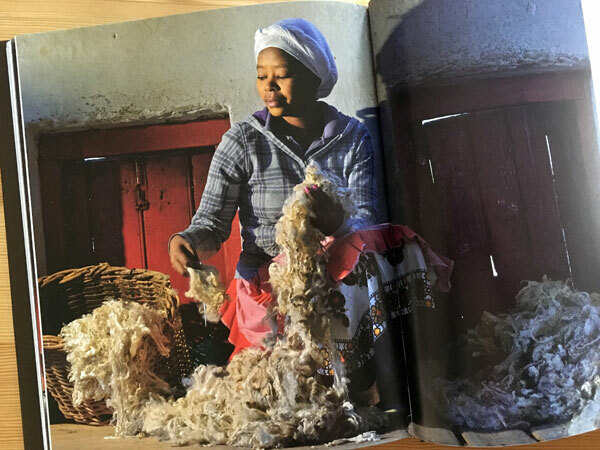 after australia, we hop over to south africa to look at the herds of one of my favorite fiber animals—the angora goat, from which mohair fiber is obtained. 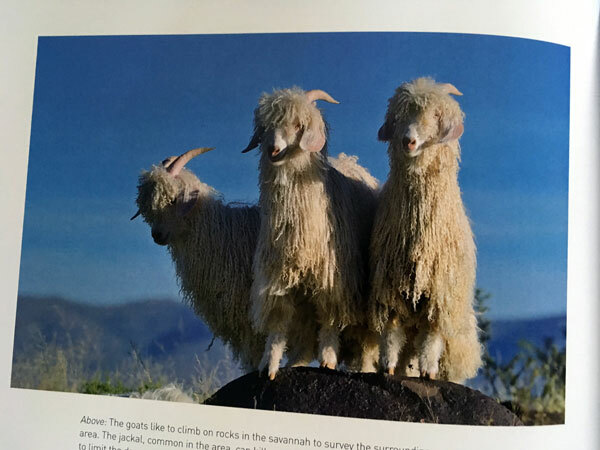 unlike the double coated cashmere goat, angoras are single coated, producing only long locks of lustre fiber. 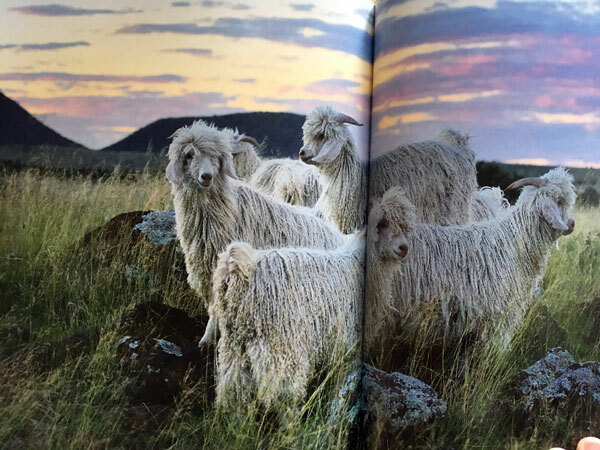 the angora goat has thrived in south africa since the mid-1800s, raised mainly in an interior mountain chain. here, a superior mohair product is produced on a third generation family farm. here, the goats can wander in a semi-wild state on the rocky terrain and are brought in twice each year for shearing. the fleeces are sorted by hand and graded for fineness and color, then milled locally or exported, depending on demand. the author points out here, that while the entire discussion of the book is focused on fibers aimed for a luxury market, economics at the farm level are always precarious. market prices for raw wool remain low; retail prices on finished goods often reflect the high cost of transportation and factory labor, rather than compensation to the farmers and herdsmen. 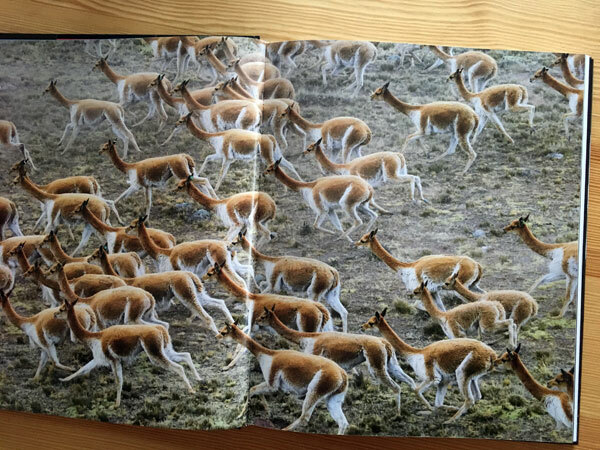 our world travels with author and photographer wind up with an examination of the almost mythical vicuña, in the high andes mountains of peru. this once plentiful creature was driven almost to extinction by the 1960s, but under extremely close supervision by the peruvian government, a program of protection and breeding is giving new life to its future. vicuña live and graze on a huge reserve, well-protected from human interference. in addition to preserving and multiplying the breed, the program provides for community based fiber harvesting, so that animal population may be monitored and fiber procured without hunting. while still considered and endangered species, today the vicuña is no longer close to extinction. i’ve run on and on, just to give you a small chunk of what’s inside this amazing book! 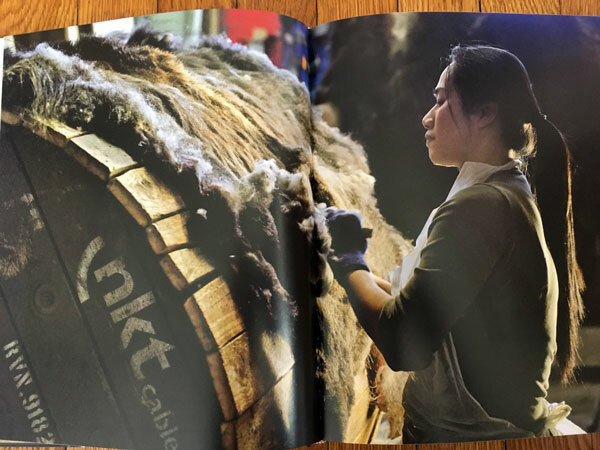 if you love the world of fiber, you will want to get yourself a copy. the subject matter is of such interest to me and i know from the popularity of our bare naked knitspot club that i’m not alone—just check out the discussion threads in our club ravelry group and you’ll see we have community that is quite excited about natural fiber). now if you’ve had the patience and/or interest to read this far, you are in for a treat. firefly books, publishers of this delicious volume, have provided a giveaway copy for one lucky reader. to be eligible, leave a comment at the end of this post before 9 pm EDST on tuesday, march 14th, telling me which of the above fibers was new and different to you. we will choose a winner at random and announce it in the blog post to follow. Thank you for introducing me to this lovely book. I want to see more! I have yet to use Pashmina…what fun that would be. I’ve heard of all these fibers, but haven’t yet knit with vicuna or qiviut. What an impressive book – I do want to read it. I’ve never heard of taevit. 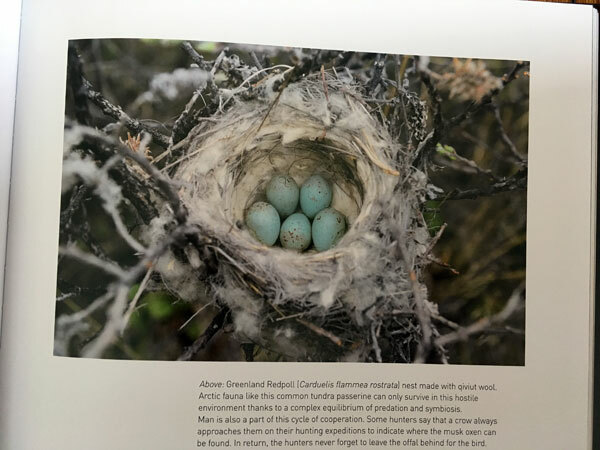 The book seems very interesting and informative with beautiful pictures. Thank you Anne for sharing it with us. What a stunning book! 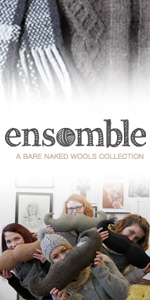 I had actually heard of all the fibers, but I’ve only worked with cashmere and Shetland wool. I am lucky to count a piece of beautiful Dormeuil fabric as one of my best thrift finds, ever! What a fascinating topic! And so beautifully photographed, from what you’ve shown us. I’m drooling. While I’ve never touched vicuna fiber, I had never even heard of taewit. The fiber world grows larger and more interesting every day! Thanks so much for this post – extremely interesting – I had never heard of taewit. This looks like a great book. I’ll have to see if my local bookstore can get it. I have never heard of taewit. What a fabulous looking book. What a beautiful book. 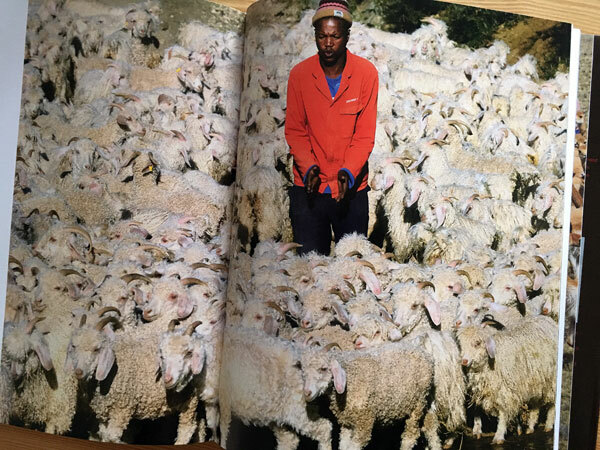 I know very little about South African’s wool industry and their angora goats. I would like to know more. Gorgeous photography! I really want to reach out and touch the wooly animals. I’ve never heard of taewit wool and had no idea there were two kinds of goats which produced cashmere. This is why I love knitting! There is always more to learn. Thanks for showing us the way. This looks like an amazing book! I had never heard of taewit yarn. Thatcover is striking and the pictures look amazing! Stunning photos. I too have never heard of Taewit. Simply: WOW. What a book! I had never heard of taewit before nor clearly understood that pashmina is actually a specific type of goat rather than a marketing name for cashmere or some other fiber. I have never heard of taewit. I would be eager to learn more about it! This is what I love about knitting- always something new to learn! taewit…I have heard of all the others, and even have some of most, except vicuna which I will need to save up for. This book looks like it will keep a smile on your face from beginning to end. Stunning! I would love to be included in the running for your generous giveaway. Thank you! I have never heard of a vicuña. This looks like a beautiful book. Thanks for the opportunity. I have never hears of Taewit. I think those angora goats are adorable. The book will be on my list for my fiber friends. What a glorious book! I had never heard of taewit before – I’ll enjoy doing some research. Learning to spin has given me a new insight into the joys of natural undyed fibres. I’ve been working my way through a raw Gotland fleece, spinning in the grease to create the most delicious yarn. It still feels like alchemy. What a beautiful book! I have not yet knit with quiviut and vicuña. Maybe someday. Such lovely creatures, all of them. And thank you for reminding me that it is because of hard-working people living in difficult places that I have the luxury of knitting. Taewit is new to me as well! I have never had the pleasure of touching vicuna either, though I know of it. 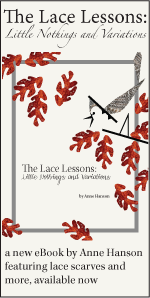 This sounds like a fabulous book–thank you, Anne, for the review! The only wool I had never heard of before was the taewit–but I would love to know more about all of them! I never heard of taewit yarn either. I’ve heard about pashmina and vicuna, but I’ve never worked with them. This is such a lovely book, and the photos are beautiful. Thanks for putting it in your blog. Pashmina goats and the vicuña were new to me. The book sounds fascinating. for some reason I thought vicuna was a man-made fiber, so that is something I learned today. I want very much to knit something out of qiviut someday. I’m not familiar with taewit wool and would love to learn more about it. I’m not familiar with vicuna and like others had not heard of taewit wool. It looks like an important and informative book, as well as being beautiful! I have heard of vicuna, but not ever seen it in person, also not heard of taewit wool. What fabulous photos, it would love to see more! What a lovely book. I don’t think I’ve ever heard of vicuña before or taewit. I had no idea what taewit was before reading your post. I also was struck by how beautiful the vicuna herd is with the curved lines along their legs contrasting with their darker sides. Thank you so much for a chance to have this beautiful book. I has to be Taewit! It would be so fun to say “Oh this, its just Taewit. Haven’t you heard of it?” …because of course, neither had I until this morning. But then I also need this book; it looks so beautiful! A short survey of wool fibers! Love it. The taewit was one I was totally unfamiliar with as probably the majority of readers. Thanks. Oh, wow! What an amazing book! The taewit is completely new to me – but my favorite will always be the vicuna, which I was lucky enough to see in person during our trip to Peru (it was hard not to try to take one home with me…). Just in the nick of time! 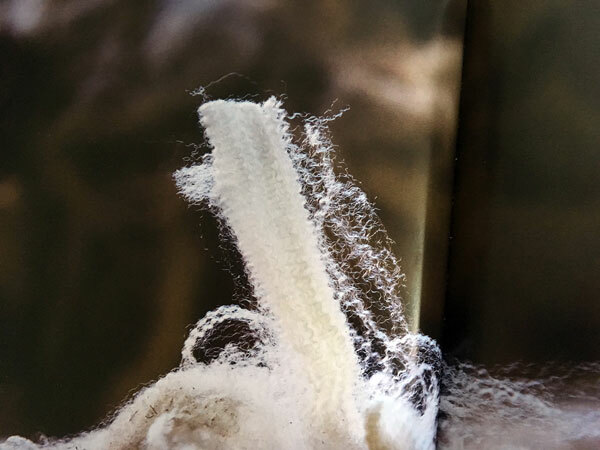 The book is amazing and I love the idea of learning where these amazing fibers originate! I’d heard of or even gotten to play with every fiber but Taewit…and of course one of the reasons I love the BNW club is the background information you include about the fibers you choose for us. What a great looking book!